Doctors are using technology in creative ways to treat those isolated from modern health care conveniences. Telemedicine consult. Photo by Intel Free Press. Dr. Raghu Venugopal – along with other staff at Am Timan Hospital in Chad – was stumped. The two-year-old patient he was attending to was feverish, his legs and back covered in an ulcerating rash. “I had never seen it before,” says Venugopal, who was medical team leader for a Médecins Sans Frontières (MSF) mission last year in Chad, a north-central African nation roiled by decades of civil strife, war, famine and drought. Chadian colleagues suggested the rash might be cutaneous leishmaniasis, a parasite-triggered skin infection that can cause severe facial disfigurement. The disease requires a gruelling treatment regimen of intravenous sodium stibogluconate that is itself highly toxic and painful to administer. Dismayed by the prognosis, Venugopal sent a skin biopsy to the hospital laboratory in Am Timan, which confirmed leishmaniasis. Still dissatisfied, he posted photos of the rash to MSF’s Telemedicine online portal. The photos were analyzed by a leishmaniasis expert in the United Kingdom, who diagnosed a common skin infection. The youngster, who was put on antibiotics, was spared a painful, dangerous and unnecessary treatment. “A medical error was prevented and harm to a vulnerable patient was prevented as well,” says Venugopal, an emergency physician and assistant professor in the faculty of medicine at the University of Toronto. MSF’s Telemedicine online portal, in operation since 2011, taps into the services of 250 medical specialists – all of whom donate their time for free. The system is designed to support MSF staff ensconced in some of the most inaccessible and dangerous places on the globe. Such locales rarely have adequate sanitation, running water, electricity, food or shelter – certainly, they lack the infrastructure needed to support broadband Internet services. So, along with medical supplies, MSF packs satellite dishes and telecommunication equipment, allowing access to high-speed Internet for connecting with medical experts anywhere in the world, 24 hours a day. “It is as easy as Facebook to upload cases,” says Venugopal. He examines patients in the morning, often using his portable ultrasound, which creates internal images of the body. “Then, if required, I upload the ultrasound images onto my memory stick, download to my computer and upload onto the online Telemedicine server. I can have a response from a radiologist in Toronto by the afternoon.” To date, more than 1,000 cases have been referred to MSF’s medical experts, Venugopal says. 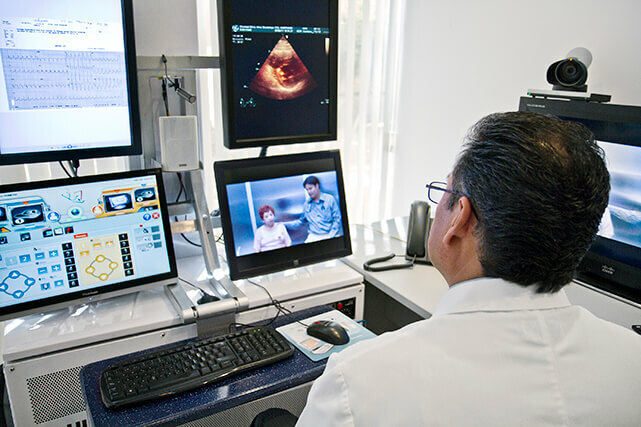 Telemedicine is bringing physicians and patients together from around the globe and, indeed, is becoming a key way to deliver medical services. It is due in part to computer science professor Stella Atkins of Simon Fraser University (SFU) in Burnaby, British Columbia, that medicine first began to transcend the limits of distance and geography. In 2000, Atkins represented Canada on a NATO Science for Peace and Security Programme (SPS) initiative to help former Soviet Union satellite states that had achieved independence in the 1990s establish academic Internet connections. The project was dubbed the Visual Silk Highway, as it included nations that intersected the ancient, 6,500-kilometre-long Silk Road trade route. Atkins’ first task with SPS was to address the concerns of the chief pathologist of Uzbekistan in Central Asia. Biopsies were being misdiagnosed, causing physicians to miss cancers and viral infections, she says. In 2008, with the backing of SPS, Atkins established a digital imaging program called iPath in Tashkent, the capital of Uzbekistan. She brought in cameras that attached to the eyepiece of a microscope. Biopsy images could then be transmitted via iPath software to a website accessible by medical experts, who suggested a diagnosis. Later, in 2010, Atkins ran a workshop out of Tashkent for chief and trainee pathologists from Kazakhstan, Turkmenistan, Kyrgyzstan, Tajikistan, Azerbaijan, Pakistan, Georgia, Armenia, Ukraine and Russia. The workshop resulted in the creation of a peer-to-peer consulting network for Central Asian pathologists. Another initiative that Atkins is part of – the brainchild of Russian and Romanian physicians and scientists – incorporates telemedicine into crisis management in case of disasters such as earthquakes, which are rife in Central Asia. Initiated in 2013, the new program allows medical responders in disaster zones to access medical consulting websites, helping them to improve crisis medical treatment, she says. Atkins is also leading an SFU-led initiative that, in 2013, created MoleScope, a tiny microscope used with a smartphone that snaps images of skin moles, a precursor of skin cancer, which afflicts six million new patients every year around the globe. MoleScope software stores images of moles, allowing physicians to monitor changes over time. To improve its efficacy, the app has a unique interface that tells the doctor exactly where the mole is located on a 3D body map, and tracks the dates that the images were taken to monitor changes. It is especially useful, says Atkins, for patients living in remote or rural areas who can’t easily travel to see a specialist. There are other useful smartphone apps being created at SFU, adds Atkins, including ones that allow doctors to monitor chronic diseases such as diabetes and heart conditions in far-away patients. Broadband Internet services are rapidly improving and, in April, a new system, called Tele-Link Mental Health Program, was put into place to help address a Canadian tragedy: the alarmingly high suicide rates of aboriginal youth. In Nunavut, founded 15 years ago as Canada’s newest northern territory, the suicide rate among the young is 28 times higher than the national average, says Lynn Ryan MacKenzie, the executive director of Mental Health and Addictions in Nunavut’s Department of Health. The people of Nunavut, which is home to 35,600 Inuit living in 25 small communities, were shattered last year when a record 45 youth ended their lives, the majority of them young males. A study analyzing the 120 suicides that have occurred between 2003 and 2006 found high rates of major depressive disorder, as well as alcohol and cannabis use and addiction. MacKenzie says this is linked to the legacy of residential schools, cultural upheaval, overcrowding in homes and food insecurity. Unfortunately, there is a lack of access to psychiatric services for both children and teens, due in part to the 3,000-kilometre distance from the urbanized south and the widely scattered nature of Nunavut communities. To tackle this problem – and provide Nunavut with consistent psychiatric care – the government of Nunavut, Toronto’s Hospital for Sick Children (SickKids), RBC Foundation and Cisco Canada created the Tele-Link program together. Tele-Link builds on SickKids’ telepsychiatry pilot that was created in 1997 to link health care workers with rural Ontario patients. To connect southern psychiatrists with the North, Cisco donated three large video conferencing suites to SickKids and 10 large desktop units to the region of Nunavut, says the program’s clinical manager, David Willis. SickKids psychiatrist Susan Dundas says she and other mental health workers can now hold face-to-face, real-time meetings with young northern patients. The screens are big enough to capture up to 10 people at a time, such as family members, counsellors and social workers. Telemedicine is a major development in helping bridge the gulf between the world’s haves and have-nots, who often lack good medical care because of a dearth of resources. Venugopal recalls one 17-year-old man who walked for days across the Democratic Republic of the Congo, the second largest country in Africa, to get medical help for a mysterious rash covering his entire body. Photos of the disfiguring condition were uploaded onto the MSF Telemedicine portal. Soon after, a dermatologist in New Zealand made a diagnosis, allowing MSF physicians in the Congo to determine the correct treatment.